Monday was Margaret's 4th birthday. 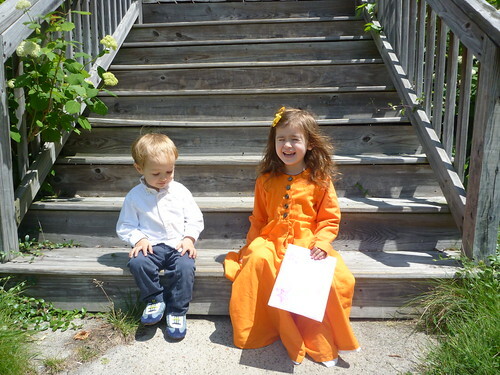 Here's a picture from the actual day that I asked her and Duncan to pose for in the blinding sunshine. It is amazing how one minute you can be in the hospital with an infant who mostly just eats sleeps and poops and the next thing you know you have a responsible little girl who is capable of actually helping out a bit when the mood strikes her. Margaret has reached the age of understanding that birthdays are about LOOT. Warren's father got her a $100 gift card for her birthday and she has been using up buying finger puppets a few at a time. She loves having her own "credit card". The other notable present is the new doll that Warren got her. It's a major hit. The doll is from a company called My Twinn. The basic idea is they make a doll that will look like the little girl it's intended for. They do a pretty good job of it too. You can customize hair color, length, texture and bangs independently, and there are a number of eye colors and skin tones to choose from. Apparently they also do freckles and birthmarks if applicable. Alas, they don't customize eye shape; I looks like they have one head mold and can't adapt eye shape or face shape. Of course if they did it would probably way more expensive. Did I mention the doll was well made? It has an impressive joint system that allows it to be posed a number of ways. All in all a very good doll. The thing that amuses me about the doll is the way that Warren found out about the company. Back during the primaries when people were attacking Romney about some of his investment decisions, someone apparently made fun of him for investing in this company. Yeah, there's a loser idea, invest in a doll company that makes affordable custom dolls for little girls. 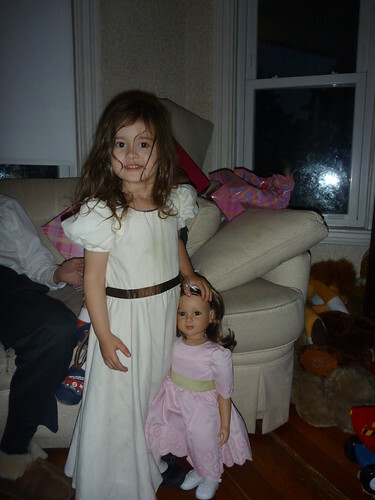 What kind of weirdo would buy a doll like that for his little girl? Yet another object lesson on just how much of the political talk on the airwaves is just glorified hot air.